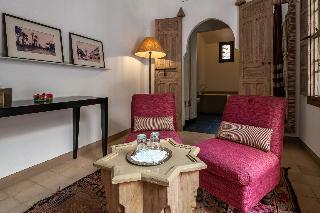 This riad is situated in the heart of the Marrakech Medina right next to the Bab Doukkaka Mosque and 10 minutes' walk from the exotic Jemma El Fna Square and from a number of shops and nightlife options. The tourist centre of Gueliz, with its many bars and restaurants, is approximately 15 minutes away on foot, as are Koutoubia and Majorelle Gardens. The main train station is a 10-minute drive and the Oukeimeden ski area is around an hour and a half by car. 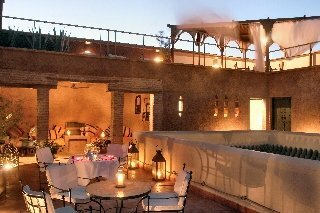 Marrakech-Menara Airport is approximately 8 km from the riad.||The charming riad is a haven of peace and relaxation, tastefully decorated with many traditional Moroccan features. It offers a patio full of plants, a winter conservatory and 2 summer rooms, and 2 terraces with fabulous views over the snow-capped Atlas Mountains and the roof-tops of the 'Red City', Pearl of the South. A dedicated team of staff will attend to guests' wishes regarding their comfort, meals and general enquiries. Guests are welcomed into the 6-room historical hotel in a lobby with 24-hour reception and check-out services, a hotel safe and currency exchange facilities. 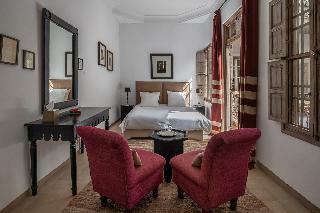 Fully air-conditioned, the city hotel also offers a TV lounge, restaurant, Internet access, room and laundry services, and guarded parking (fees apply).||The guest rooms have a queen-size feather bed with embroidered cotton percale linen that can be adapted according to the season, and a dressing room equipped with individual safe. 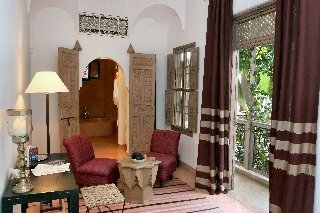 The en suite bathroom is decorated in ochre tadlakt tiles and equipped with a bathtub, shower, WC, hairdryer and 'Les Sens de Marrakech' soaps. Embroidered dressing gowns and sheets are provided. 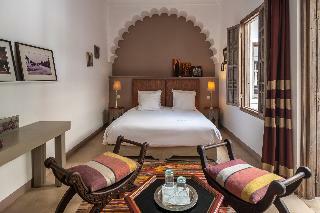 The rooms are 30 m² in size and other in-room amenities include Internet access, a cooker, tea and coffee making facilities, and individually regulated air conditioning and heating.||The riad offers cooking lessons, spa treatments and massages. Sun loungers and parasols are laid out for use around the swimming pool.